Thiosulfate Citrate bile salts sucrose (TCBS) agar is a selective as well as differential culture medium used for selective isolation of Vibrio spp from a variety of clinical and nonclinical specimens. Vibrio cholerae is the causative agent of cholera. Other Vibrio species have been associated with gastroenteritis and extraintestinal infections, especially of the ear, soft tissue, and blood. TCBS has a very high pH (8.5-9.5) which suppresses growth of intestinal flora other than Vibrio spp. The bile salts inhibit growth of gram-positive microorganisms. Vibrio spp produce either yellow or green colonies on TCBS, depending on whether they are able to ferment sucrose. If the sucrose is fermented, yellow colonies are produced. Vibrio cholerae produces yellow colonies in TCBS whereas Vibrio parahaemolyticus produces green colonies. Ferric citrate: Sodium Thiosulfate is also a sulfur source, and acts with Ferric Citrate as an indicator to detect hydrogen sulfide production. Bromothymol blue/ thymol blue: pH indicator. pH 8.6 ± 0.2 @ 25°C (Note the alkaline pH): An increased pH is used to enhance growth of Vibrio cholerae, because this organism is sensitive to acid environments. TCBS agar is commercially available and easy to prepare, requires no autoclaving. Suspend 88 g of the medium in one liter of purified water. TCBS agar is green when prepared. Results of culture is read after overnight culture (18 to 24 hours). V. cholerae will produce large (2 to 4 mm in diameter), slightly flattened, yellow colonies with opaque centers and translucent peripheries. V. cholerae and its biotype Eltor ferment sucrose, this result in decrease in pH and production of yellow colonies. V. parahaemolyticus, produce green to blue-green colonies as it does not ferment sucrose. Suspicious colonies for further testing should be subcultured to a noninhibitory medium, such as triple sugar iron agar (TSI). TCBS Agar may not support good growth of some Vibrio spp. (e.g., V. hollisae and V. metschnikovii). The identification of the various Vibrio spp. on TCBS Agar is presumptive and further tests are required for confirmation. It is recommended that a non-selective media be used in conjunction with selective media for optimum recovery of pathogenic organisms. 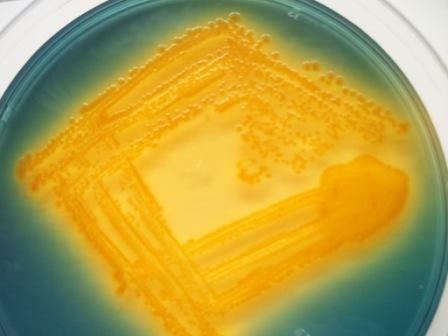 Cultures grown on TCBS should be examined immediately after removal from the incubator as yellow colonies of Vibrio spp. (e.g., V. cholerae) may revert to a green color when left at room temperature. There are colonies are black in TCBS media what is it ? Any changes plate kept for 30°c for 39 to 48 hrs?